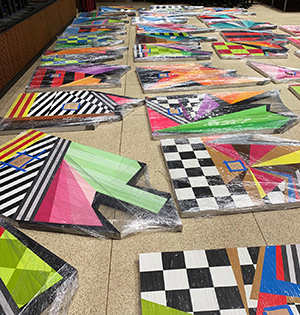 “Bloom Bash” mural installation is underway at the San Diego Museum of Art! 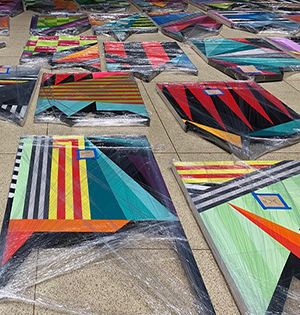 The BLOOM BASH 2019 “Geo #98” mural installation is under way here at the San Diego Museum of Art in Balboa Park! 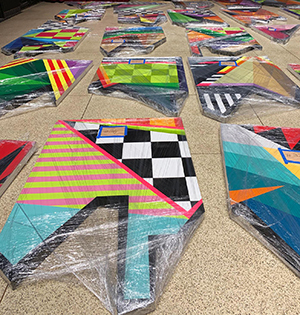 Here are a few of the 44 pieces that complete the 176ft mural which is currently being pieced together on-site and will be suspended from the roofline of Panama 66 and unveiled at the opening #bloombash party this Friday, April 12th from 7pm until 12am. and ”Exhibits” on montymontgomeryart.com for more information. Thank you to the entire San Diego Museum of Art and Pacific Event Productions TEAM! @sandiegomuseumofart @polychromist @pacificeventproductions @steffbadgett @djagow @oneeyedlauren @sdmasocial and so many others!